2016 ND of the Year! 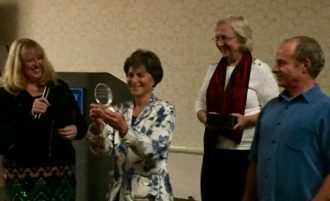 The New Hampshire Association of Naturopathic Doctors (NHAND) recognized two of its own members in a ceremony this past Friday, November 4, 2016 in North Conway. Dr. Kristy Fassler and Dr. Leon Hecht, both practicing in Portsmouth, ND for the past 27 years, were instrumental in helping naturopathic doctors obtain licensure as in the state of NH in 1995, instituted in 1996. Graduates of Bastyr University in Seattle, Drs. Fassler and Hecht returned to NH where the term naturopathic doctor was foreign to most. Through their diligent efforts, they helped make naturopathic medicine a licensed profession in the state of NH, ensuring the public that any doctor utilizing that title attended a nationally recognized medical program. They have been in practice in Portsmouth at their clinic, North Coast Family Health, where they specialize in Lyme disease, endocrine disorders, cardiovascular disease, osteoporosis and digestive complaints and have aided thousands of patients throughout New England. Naturopathic doctors are trained in the art and science of natural health care at accredited medical colleges and universities. A licensed naturopathic doctor attends a four-year graduate- level naturopathic medicine school accredited by the Council of Naturopathic Medication Education and takes rigorous professional board exams so that he or she may be licensed by a state or jurisdiction as a primary care general practice physician. NDs are educated in all of the same basic sciences as an MD, but also studies holistic and nontoxic approaches to therapy with an emphasis on disease prevention as well as optimizing wellness. NHAND is an organization comprised of New Hampshire state licensed naturopathic doctors. Founded in 1988, with the intention of advancing the philosophy and practice of naturopathic medicine in NH, the organization continues to grow and be active in New Hampshire with organizing the largest yearly naturopathic medicine conference in New England, which took place the first weekend in November at the North Conway Grand Hotel. NHAND and its members are dedicated to offering the people of NH the very best in safe and effective health care. Many congratulations to Drs. Kristy Fassler and Leon Hecht on receiving the 2016 NHAND NDs of the Year Award!